Infinifactory is a fine, fine puzzler, an intimidating one. Thankfully, Zachtronic’s clever twist on scoring keeps me going back for more. High score tables have been a feature of games since the beginning and there was a great pride in being able to put your initials into an arcade cabinet. Home gaming necessarily limited high scores to the group of people who’d physically sat in front of the TV to play, quite possibly leaving you to compete only with yourself. The advent of online gaming changed that, and suddenly global leaderboards were virtually mandatory. But for those of us who aren’t actually that competitive such in-your-face demonstrations of our relative incompetence against the best of the world is counterproductive as best, dispiriting at worst, more likely to be ignored out than taken as a challenge. Infinifactory has leaderboards, of a sort, and they’re brilliant. Because they aren’t tables, they’re histograms. There’s no denying that scoreboards generally appeal to a certain kind of gamer, one that thrives on competition. Hard numbers quantify your position in the world, your absolute and relative performance in the game. “Thirty seconds slower than the best”. “20,000 people scored higher than you”. Boards that focus on the table around your current rank are a little more friendly; showing you how little improvements can lift you up, but it’s still you vs the world, better than Sm1l1ngA55a55in902 but worse than fluttershylovr. By using histograms Infinifactory changes the whole tone of the scoreboards in three important ways. Firstly, it removes the hard numbers and only shows you where your solution stands relative to the general population. Most levels have a fairly straightforward bell-curve, so any given first attempt is going to fall somewhere in the middle, or towards the tail. It’s a gentler way of showing you how much room for improvement there is. Secondly, the shape of the histogram can tell you interesting things about the level. Most approximate a bell curve, but some are bi-modal or even wonkier, hinting at multiple viable solutions that can differ wildly, encouraging a more experimental approach rather than forever tweaking your current solution. 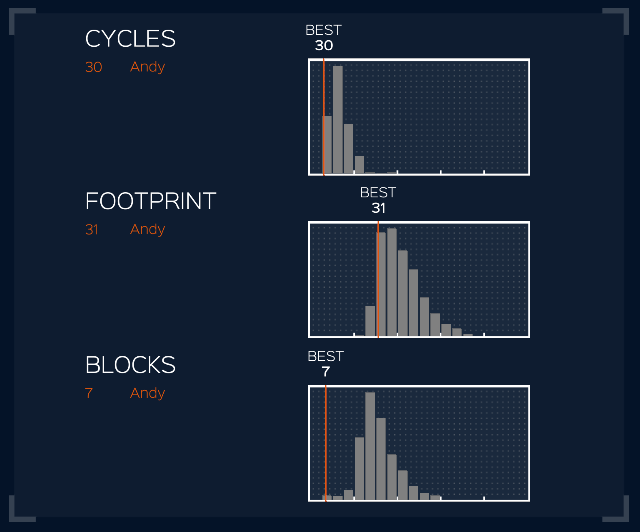 Thirdly, and possibly most important, each level scores you on three metrics, and you get three different histograms. In the vast majority of cases the optimal solution for one score is awful at another. Optimizing for blocks often involves removing most of your conveyors and murdering your speed. Decreasing your footprint usually involves more complex vertical structures requiring more blocks, and so on. This has the effect that a good score in one metric leads to a bad score in another, getting you used to living with bad scores. Obviously Infinifactory’s scoring system isn’t suitable for everything, and many games absolutely are based around ranks and numbers, but as a developer if your goal is providing replay value more than direct competition then Zachtronics might just be showing you the way.